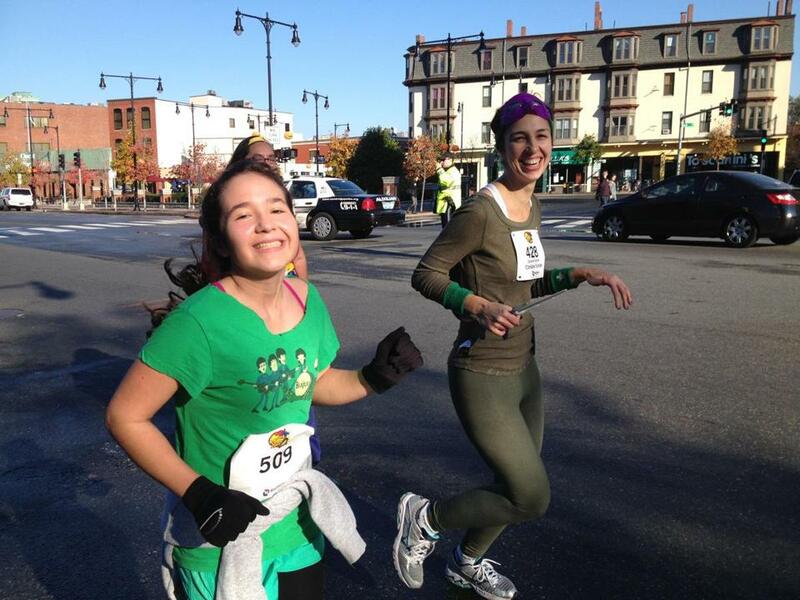 Marina Pineda Shokooh, 13, runs with Coach Christine Turnier in the season-ending Super Hero 5K last October. On a recent Tuesday night, among the crowd of seasoned runners circling the Gordon Indoor Track at Harvard University, there was a group of much younger racers. The young runners were members of Title IX Girls Running Club, a nonprofit started in 2007 by veteran marathoner Stacy Rodriguez-Rennard. Also a licensed mental health clinician, Rodriguez-Rennard has spent her career working with adolescents exposed to trauma. The running program, which is held three times a year, centers around what’s called the Whole Girl Curriculum. Drawing on her background, Rodriguez-Rennard designed it to not only focus on building the girls’ physical strength, but also to enhance their emotional development, by incorporating lessons on how to be confident, mindful, compassionate, and strong. Each session of the running club lasts eight weeks. In the winter, the group meets on Tuesday nights at Harvard. The first 45 minutes of a recent session were spent working up a sweat. Volunteer coaches led the girls, who hail from 18 cities and towns across Massachusetts, through a series of warm-ups, strength exercises, and stretches. Then they ran. The girls were each given a tailored workout, and divided up into smaller groups according to ability level. As they ran lap after lap, they were not only coached on the physical components of running, such as proper form and stride, but were also instructed on proper breathing techniques, which can be beneficial both on and off the track. The Title IX Girls Running Club holds three sessions a year in Cambridge. Helen Buckley-Jones, who is in her third season, says the club introduced her to a sport that she is now passionate about. Her teammate, 10-year-old Abigail Rabieh, agreed. Another component of the Title IX club involves journaling. When they were finished running, the girls broke off into three groups. They sat in a circle and wrote about their thoughts and feelings, or any issues they were having at school or at home. The makeup of the group is diverse. But regardless of the girls’ backgrounds, or any challenges they may face, running acts as an equalizer. “One of the beautiful things about this club is that it’s designed to be all-inclusive. From the girl who is a multi-sport athlete to the girl who cannot stand gym class to the girl struggling with disordered eating or unhealthy coping, there’s room for everyone,” Rodriguez-Rennard said. More than 500 girls have participated in the program since its inception. Title IX recently teamed up with researchers at Tufts University to collect data from post-season evaluations, which they hope to publish in a study. So far, the results have been positive, with 79 percent of parents reporting an improvement in their daughters’ confidence as a result of participating in the club. They’ve also noticed an aversion to risky behaviors, and an overall sense of well-being. Linda Rabieh, whose daughter Abigail is in her fourth season with the club, echoed similar sentiments. Watch a video about the Title IV Girls Running Club at Boston.com/GetMoving. Alexa Pozniak can be reached at apoz@aol.com. Follow her on Twitter@ApozTV.